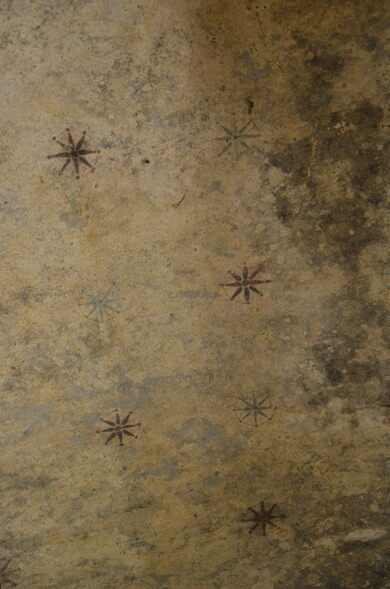 The underground sanctuary of a mysterious ancient Roman religious cult contains an exquisite traditional fresco. “Mithraic Mysteries” was a widespread religious cult within the Roman Empire that flourished from the first century until its demise at the end of the fourth century. Numbering in the hundreds, Mithraic sanctuaries, known as “mithraeum,” are found from one end of the former empire to the other, from Rome as far away as England. The mummified relic of St. Antoninus. Ever hear of the Milazzo Cage? One of four skulls claiming to belong to the beheaded St. John the Baptist is on display at this Roman church. 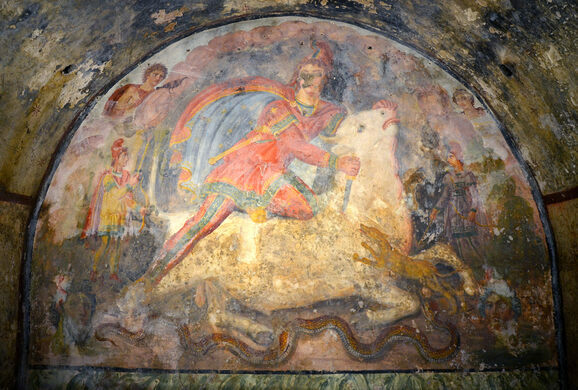 The mithraea were windowless subterranean caverns, all of which featured a tauroctony, a painting or bas-relief of a figure thought to be the god Mithras (who is dubiously linked with Persian religions) depicted in the act of killing a bull. The scene is typically located in the central niche of the mithraeum, accompanied by other figures, like a dog, scorpion, snake, raven, stars, and the signs of the zodiac. 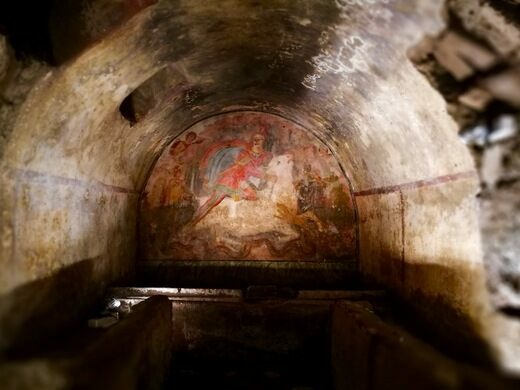 A mithraeum containing an exquisite traditional fresco is located in Santa Maria Capua Vetere, Italy. 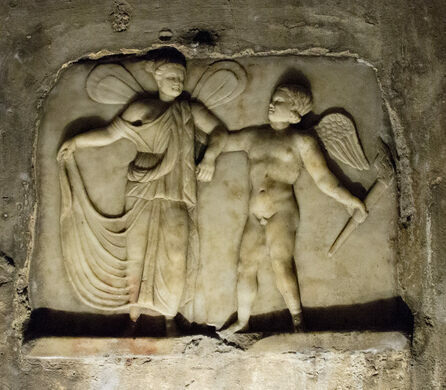 Though built in the second century, this mithraeum wasn’t rediscovered until 1922 and excavated until 1924. At the very end of its central 10-foot-high, L-shaped corridor is an altar. On the wall above is a fresco depicting Mithras slaying a bull with a large knife while sporting a cape emblazoned with stars. Surrounding him are a snake, dog, raven, and several human figures and faces. Mithraism has been seen by some as a rival to Christianity, which was beginning to expand within the Roman Empire at the same time. Unlike Christianity, whose theology and history was well-documented in gospels, letters, and voluminous treatises by early church fathers, there’s little written evidence to help unravel the Mithraic Mysteries. Euboulus and Pallas were said to have written histories of the religious cult, but both these books are lost. All that is known comes from fragmentary inscriptions and brief passing mentions by Roman-era Greek and Latin writers. Many of the initiated came from the Roman army. Women were excluded. The actual teachings of Mithraism were kept secret from outsiders and only fully revealed to members after they had completed seven levels of initiation, which have been symbolically linked to the planets. Given that the bull-slaying tauroctony is the central feature in every mithraeum, some have assumed that by deciphering it, Mithraic secrets might be revealed. According to one line of thought, the iconic scene is actually a star map that credits Mithras with being responsible for how the precession of the equinoxes relates to the zodiacs. Though some speculate the tauroctony represents the moment when Taurus is slain and replaced by Aries and Libra, heralding the end of one cosmic cycle and the beginning of a new age, their conjectures are based mostly on circumstantial evidence rather than a first-person account written by an initiated Mithraic follower. A ticket to the Capua Archaeological Museum (located at Via Roberto d’Angiò, 48, in Santa Maria Capua Vetere) includes admission to the mithraeum two blocks south at Vico Mitreo, off Via Pietro Morelli, and to a first-century A.D. amphitheater, second largest after Rome's Coliseum, two blocks to the north. This Roman amphitheatre was also the location of the first gladiator school. Nobles would stage mock naval battles on this large lake at the Royal Palace of Caserta. This medieval Italian town is a sheer (and beautiful) cliffside defense. Underground paleo-Christian burial site, composed of the remains of several cemeteries and Basilicas. The city of Palestrina was built around this magnificent terraced sanctuary dedicated to the pagan goddess Fortuna. A spiritual sanctuary in a natural cave. An ancient underground cultic temple where sunlight penetrates on the summer solstice. One of its engravings is believed to be among the first representations of medical and surgical instruments.